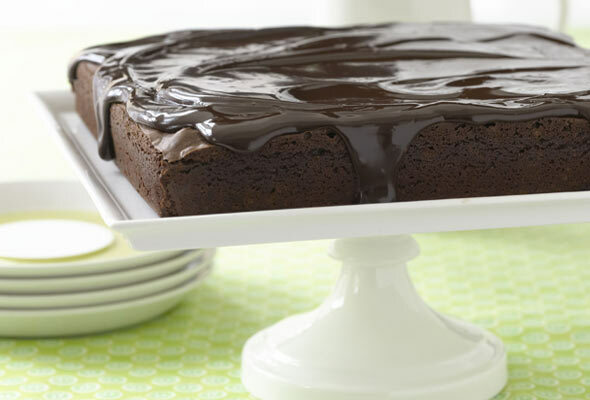 Trisha Yearwood’s chocolate torte is essentially a 12-layer vanilla cake that’s smothered with chocolate glaze. A sophisticated dessert that’s surprisingly simple to make. Yes, we understand, you don’t always have the time or patience for tradition–or lots and lots of layers. So sure, why not, go ahead, bake the batter in two standard 9-inch round cake pans and then stack and frost the two layers as is, as you would any layer cake. Then call it a day–a darn good day. 1. [Editor’s Note: Be sure to make the glaze before you bake the cakes.] In a large saucepan over medium-low heat, melt the butter. Add the chocolate and stir until melted. Add the sugar and stir until it dissolves. Then stir in the evaporated milk, vanilla, and the instant coffee. 2. Cook the glaze over medium-high heat until it boils. Reduce the heat to low and continue cooking, stirring constantly, until the mixture thickens, about 20 minutes. 3. Remove the glaze from the heat. When cooled a bit, return to low heat as needed, as the glaze must be warm to spread on the cake layers. 4. Preheat the oven to 350°F (176°C). Butter and flour at least four 9-inch cake pans. 5. Cream the butter and sugar until smooth. Add the eggs, one at a time, beating just until blended after each addition. In a small bowl, mix the vanilla with the milk. Add the flour to the egg mixture alternately with the milk mixture, beginning and ending with the flour. 6. Pour a very thin layer of batter—about 7 tablespoons—into each pan, shaking the pans to distribute the batter to the edges. Bake the layers for 11 to 13 minutes. Immediately remove the layers from the pans and, working one at a time, place the layers on a cake stand and immediately frost with the rewarmed glaze. Bake all of the remaining batter in this manner. You should be able to get 12 layers from this recipe. Continue to stack the layers, sandwiching them with glaze, reserving the last of the glaze to dribble over the top of the cake. An impressive cake. The thin layers of both cake and icing were visually appealing as well as delicious. The icing has a taste similar to brigadeiros, or Brazilian chocolate fudge balls, with an almost caramel-like quality to the chocolate and coffee flavor. The recipe calls for an interesting technique of layering the cake while still hot, and it worked. It's labor-intensive, but the extra time in baking thin layers of batter is definitely offset by not having to cut standard-size cakes into layers and deal with all the crumbs while spreading the icing and assembling them. I halved the recipe and got 8 layers from it, although I needed more than the amount of icing specified to effectively cover each layer. I also made the cake gluten-free, and the recipe adapted perfectly. The finished cake is not really rich, but is very sweet. I might be inclined to reduce the sugar next time I make this, but it's otherwise a wonderful dessert. I must admit that when I first read the recipe, I was a bit overwhelmed, but I was quite surprised at how easy this cake is to make and how beautiful and tasteful it is. I follow a gluten-free diet, so I had to switch the self-rising flour for the exact same amount of all-purpose GF flour ( Bob's Red Mill) and did what Jeane's (http://www.artofglutenfreebaking.com/2012/06/self-rising-flour-gluten-free/) site says with regard to adding the baking powder and salt. Worked beautifully. I was able to divide the batter into 3 pans and divided each cake into 2 layers, so I had 6 layers altogether. I'm sure I could have cut each into 3 layers, but I was too scared of breaking them. We had friends over for dinner and this was an absolutely HUGE success. 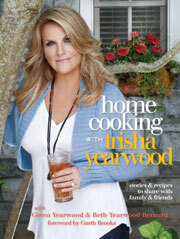 Trisha Yearwood's Chocolate Torte Recipe © 2010 Trisha Yearwood. Photo © 2010 Ben Fink. All rights reserved. All recipes and photos used with permission of the publisher. This looks suspiciously like our New Orleans tradition of the doberge! No party or birthday was complete without a tray of the doberge petit fours. But the real trump card was having a doberge cake sitting in front of you on your birthday. There was chocolate, caramel, and the best: lemon! And if your Mom was really clever, she would order one that was “a halfer” which had one side chocolate and the other side lemon. Oh boy, with a birthday coming up I can only hope that someone goes to Gambino’s and gets me one! I am going to try this and see how close it really comes to my memory of “the best.” I would guess that this one is right up there near the top of my Flavorites List! This can be adapted gluten-free? Oh, then I -really- do need to look at it. What sort of flour did you use to substitute, Tamiko? How about a 7 year delay in replying? I did make this gluten free, and I would have used my own blend with 1/4 cornstarch for lightness added in to make the total volume. I find gluten free baking does really well with adding a bit of almond flour in also. So, I would try 1/2 cup almond flour, 1/2 cup cornstarch, 3 cups gluten free blend of choice. Cup 4 cup would do just dandy if you don’t make your own. Since there’s no leavener, add 1½ teaspoons baking powder and ¼ teaspoon salt for each cup of flour used. We’ll happily accept your tips and tricks, Tamiko, thank you! This is the dessert to have in Nags Head, from what I hear. There were several restaurants advertising it as the dessert to have. I didn’t have any. I was hoping when I bought The Outer Banks Cookbook that there would be a recipe for it since I missed having a slice. Nope. I am printing this and making it for my birthday in December. Thanks. I am looking forward to finally trying this. Oh wow! It’s gorgeous. I’m going to have to try this chocolate torte for my blog. I don’t think I can cut cake layers THAT thin! I made this cake yesterday and it was a big hit. It wasn’t difficult, just a little time consuming. I made some hazelnut praline and sprinkled it on top which gave it a bit more texture since it’s pretty plain otherwise. I will definitely make it again but might brush some of the cake layers with Frangelico to give it a bit more flavour. When I saw this cake, I just knew I had to make it for a special occasion. My wonderful daughters birthday is this weekend and I spent about three to four hours making it last night. I was a labor to me as how it is made. I have made this kind of cake before but only seven layers and I always made the layers first and then made the cooked icing. The advantage making it Trisha’s way is that you don’t have to worry about where to put all those layers and the chance that being so thin they usually dry out. I cooked the icing just like it said, but I did not think it was thick enough and cooked it about seven minutes longer. The icing ran down on the sides of the dish and would not get hard quick enough. The last layer started to split so I hurried and got the toothpicks. I put the cake in the fridge and went to bed. I got up this morning and the icing was hardened and I heated up the leftover icing just a little bit and spread it over the top. I cleaned up the sides of the cake dish and now it looks so beautiful. The layers wanted to rise higher in the middle as I was adding them to the cake. I was a nervous wreck. Now we have to travel two hours to our daughters house. I do hope it survives. I think Trish could have given more instructions on making the icing. Would I make it again? It depends on how good it will be Saturday and how the family receives it. IF it is great then I would make it for any of our three children and anyone that I love dearly. By the way I did get twelve layers, and the last two were a little bit bigger so I could use all the batter. Thanks Trisha for the recipe. Gosh, the cake is a mile high I tell my husband, and I call it the one-hundred dollar cake like the whole coconut cake is at the Charleston Magnolia Restaurant. I know because my neice bought one for her husband. A true labor of love! Sounds like everything turned out well, but let us know how it goes tomorrow! Hi Rachel, We arrived at our daughters house with no damage to the cake. Well the Chocolate Torte was a big hit at our daughter’s birthday this weekend. WOW, was the word of the night. It was so moist, and the icing was so tasty. I did not think it was overly rich. I would definately make it again for someone special in my heart. Thanks much for the recipe. Yes, I do live in Charleston. That coconut cake is amazing isn’t it? So glad that the torte was amazing as well! I made this cake for my daughters 5th birthday. I used half round tin cakes and the other half with a love heart tin that fit edge to edge of the round tin. There was ample chocolate glaze to layer and cover the entire cake. Thanks for the recipe! What a lucky daughter! Loooove the heart-shaped tins. And you’re welcome, MrRustic. Our pleasure. How can I convert this to a gluten free recipe for my daughter as she cannot have gluten? I reproduced the recipe, but instead of self-rising flour I used the same amount of Bob’s Red Mill GF flour and then, as per the instructions on this site http://www.artofglutenfreebaking.com/2012/06/self-rising-flour-gluten-free/, I added the salt and baking powder. It came out amazing. We had guests over and no one even realized it was made with GF flour. I would definitely suggest that you try it. It’s also much easier to make than I had expected. I used three pans, and cut each of the cooked cakes into two layers. It looked and tasted amazing. My 14-year-old daughter wants this exact same cake for her 15th birthday. Hope this helps. Sofia, wonderful to hear it, many thanks. This certainly makes going gluten-free quite a lot more tolerable…. Hey there! 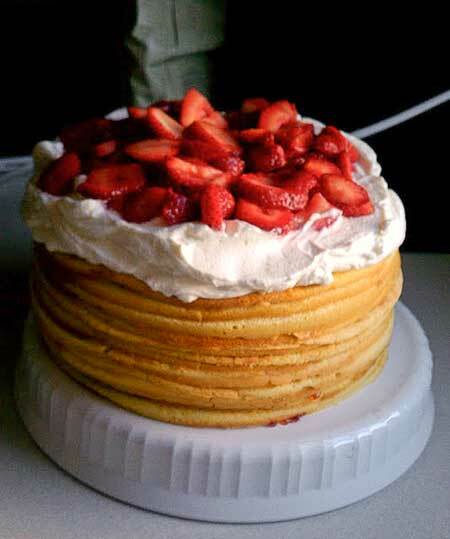 Your cake was the inspiration for a cake that I made using the “pancakes” as my muse. Instead of chocolate glaze I used strawberry! It was a big hit with my family. Thank you for sharing! Julia, my pleasure. Your cake is a stunner! Do you know what’s even easier than this method and makes the layers even thinner? Spread about 1/4 cup on the BACK of the cake pans; I use Baker’s Joy to make sure they’ll come off easily. That’s the way I learned to make Dobostorte (my all-time favorite). Ellen, many thanks for sharing your trick with us! 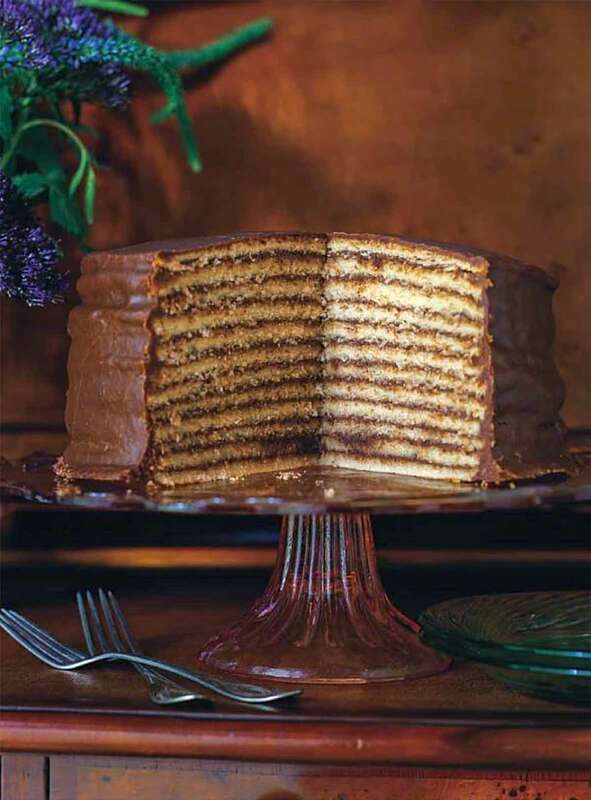 “The most well-known of the typical tortes include the Austrian Sachertorte and Linzertorte, the German Schwarzwälder Kirschtorte and the many-layered Hungarian Dobos torte. But other well-known European confections are also tortes, such as the French Gâteau St. Honoré. Tortes are commonly baked in a Springform pan.” From wikipedia. Traditional Southern, as in the US? I don’t think so! Torte is European, not your American tradition, ours! Yes, Nina, you are correct. A torte is originally European. But those European traditions came to the South many years ago and were adopted into the cuisine. Although I will say that I see these most often referred to as a 12 layer cake, many times done as a caramel cake. My glaze came out really sticky. Did anyone else have this problem? What did I do wrong? Hi Sara, I’m reaching out to our testers to see if they had a similar question. Just curious, what was your weather like when you made the cake? Sometimes humidity will affect the consistency. Beth, The weather can effect the out come of your cake. If it’s raining or the humidity is high there are some things I will not bake. Example 7 minute icing. I did make a 7 layer cake with high humidity and it took the icing longer to set. I ended up putting the cake in my icebox. Thanks for your comment, Charlotte. I’m sure it’s helpful to some of our readers! what can I substitute the coffee with in this recipe or can it be omitted? gwen, the coffee can be successfully omitted, yes. Do you have to use salted or unsalted butter? Can you use margarine? Andrea, I always, always bake with unsalted butter. I prefer to add any salt on my own. I would caution you against margarine. First, it’s a trans fat and isn’t healthy for you, and it will act differently than butter in this recipe. Is it ok to use cake flour (Swans) instead of self rising flour? Charlotte, I wouldn’t, for a few reasons. But the biggest is that cake flour creates a more delicate cake, and it might be too fragile for this recipe. I’d stick to the recipe as written–that’s what we did and we loved it. Can this be made a day ahead and what’s the best way to store this cake? Hi Macalla, I would show off this beauty on a cake stand with a domed lid. If not, a cake container would be fine. Can this be made a day before serving? Hi Brad, sure, you can make this a day ahead. I would place it in a cake keeper until ready to serve. This has become a new tradition at our house. It looks harder then it really is. Just don’t over think it. Charlotte, so glad to hear that! Happy holidays! Is it best to use dark chocolate or milk chocolate? I am making this for our churches Homecoming tomorrow! Hi Cara, I would use Bakers Unsweetened Chocolate. It is readily available in most grocery stores. Have fun at your homecoming! I make custom decorated cakes as an occasional side job, but every December I make my husband a birthday cake that’s too delicious (too moist, too tender, too chocolaty, etc.) to be decorated since both of us tire of the plain white cake and buttercream frosting I use for most other cakes. This was perfect. It was impressive on the inside, but kind of a mess on the outside. And so, so moist. Everyone loved it. 1. Buy disposable pans. I paid $5 for 12 pans and was able to evenly distribute all the batter at once. I actually could have made more than 12 layers from the batter if I’d had more pans. 2. Ignore the part about the glaze thickening. Mine never got much thicker than it started and I cooked it for a long time because I was nervous. The thin consistency was great for pouring on the cake and still solidified at room temp. 3. Put a cardboard cake circle (available at craft stores) a little bigger than your cake layers under the first layer. Cover a sheet pan with foil. Place a cooling rack on the sheet pan. Place the cake circle on the cooling rack. This allows the excess glaze (and there will be lots) to drip into the pan. If you’re running low on glaze you can scrape the excess off the foil. After the cake has set for a bit, slide a spatula under the cake circle and move to a cake plate. My cake circle was completely covered in glaze so no one knew it was there. 4. Let the glaze cool to nearly room temp before doing one last coat around the side. It still won’t leave the cake smooth, but covers some bumps. Many thanks, Angelyn! Your husband is a lucky guy.